a wedding in Umbria, live music, Locanda del Teatro, Montefalco, Perugia. Home » LIVE! VIDEO LIST » A wedding in Umbria, Locanda del Teatro, Palazzo Bontadosi, Montefalco. A wedding in Umbria, Locanda del Teatro, Palazzo Bontadosi, Montefalco. A wedding party in a beautiful venue in Montefalco, Umbria: Locanda del Teatro – Palazzo Bontadosi Hotel & Spa – Piazza del Comune, 19 – 06036 Montefalco, Perugia, Umbria, Italy. The bride and groom, Kristin and Edward, have been fantastic as the venue they have chosen. Palazzo Bontadosi is located right in the central square of the town of Montefalco. On the firts floor of the same building there’s Locanda del Teatro, one of the best restaurant in the region. The restaurant staff members coordinated by Mr. Paolo are attentive and very friendly. G. & S. also tasted their savory dishes giving them five stars as they absolutely deserve! From the Locanda garden you can see the stunning view of a piece of our beautiful Umbria. It was a very nice evening, Guty & Simone played during the after dinner dance party. As always the guests had really appreciated their performance and the restaurant and hotel staff too. 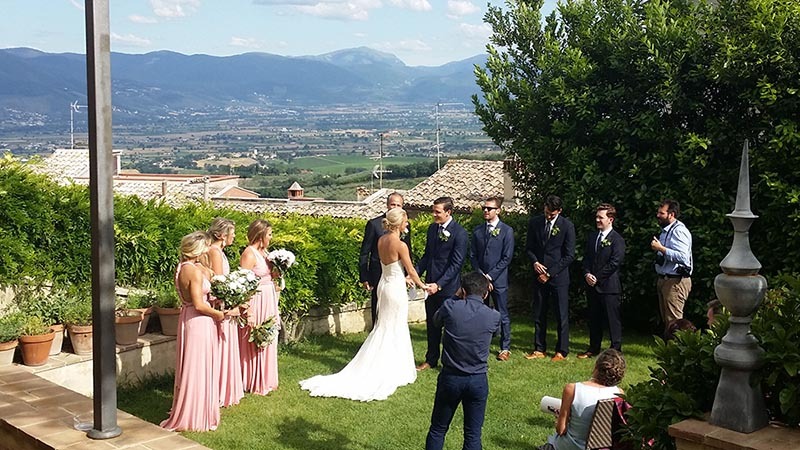 A wedding in Umbria, simply amazing! Here you are some from the several reviews about the famous Italian wedding musicians duo you can find on line. A wedding in Umbria. Locanda del Teatro / Palazzo Bontadosi Montefalco, Perugia, Umbria. A wedding in Umbria. Locanda del Teatro garden. Palazzo Bontadosi Montefalco, Perugia, Umbria.